Alistair and Liam chose an orange & white theme for their big day. Two large candle bowls, lit by replaceable inner candles, provided a soft glow at both ends of the head table. For the unity celebration, the side candles featured individual initials, the main candle shows both initials intertwined, together with the date. A matching orange wax band links all candles. The set is finished with a pair of long slim tapers used to transfer the flames. 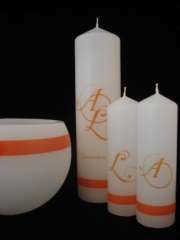 The candles measure 250x65mm and 150x45mm. To view photos of the ceremony, see our Gallery. Please contact us to discuss your own ideas and requirements. If you are interested in this design or personal variations, please send us an email. Or if your prefer, click here for full contact details. Prices subject to change. Photos are indicative only.